- HOW DO I ...? The ENHANCED PROFILE function of the GymRat RECRUITING INDEX was developed in conjunction with research and feedback from college coaches about how they want to be able to track and follow players throughout the recruiting process, as well as input from recruited players at all levels about what was helpful for them throughout their recruitment. Most high school players (and parents) greatly underestimate the skill level needed to play college basketball at any level….Division I, II, or III. College coaches at ALL levels are paid to build successful programs. Over 541,000 players compete in boys high school basketball & over 433,300 players compete in girls high school basketball across the United States each year. Players must differentiate themselves from the very large crowd both in terms of their skill level and their preparation for the recruiting process. While an online recruiting profile alone will NOT get you recruited (No coach that values his or her program will recruit a player without watching them play in person), it is a very valuable tool in today’s crowed recruiting landscape. With that in mind…. The initial goal of any player’s recruitment process is to be seen in person by college coaches and evaluators, and to have those coaches and evaluators continue to track them throughout the process. 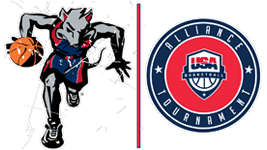 With a highly credible internal Evaluation Staff comprised of expert current and former professional, college, and high school coaches, professional players, and media members, no event in the nation does more to publicize top-performers than the GymRat CHALLENGE. The powerful grouping of a high-exposure, highly credible event and a state of the art player profile and tracking system makes the GymRat CHALLENGE and the GymRat RECRUITING INDEX an authoritative and unparalleled combination on the basketball recruiting and exposure landscape. An ENHANCED PROFILE in the GymRat RECRUITING INDEX allows college coaches to research and track you before, during, and after the event. The more coaches and evaluators know about you, the more likely they are to take the time to watch you play in person. A complete ENHANCED PROFILE in the GymRat RECRUITING INDEX is a tremendously valuable tool in helping players accomplish their initial goal of having college coaches and evaluators watch them play in person. ENHANCED PROFILES are viewable by college coaches and evaluators before, during, and after the event….365 days a year. With an ENHANCED PROFILE, players have the ability to provide information that’s critical to those who will be viewing their profile including academic information, links to highlight and game video, basketball references, and high school and AAU schedule information. ENHANCED PROFILE users will also have the ability to track exactly what coaches and evaluators have viewed their profile as well send messages to and receive messages from those coaches and evaluators. ENHANCED PROFILES are a one-stop portal and consolidation of critical information that college coaches are looking for throughout the recruiting process, as well as information that our Evaluation Staff is seeking during their pre and post-event research. The combination of this service in conjunction with one of the biggest and most competitive events in the nation in the GymRat CHALLENGE ensures that every ENHANCED PROFILE will be viewed by college coaches and evaluators that are active in the recruiting process. With over 180 college coaches, publications, and scouting services in attendance at the GymRat CHALLENGE, there is an instant ability to translate an ENHANCED PROFILE into direct on-site assessments by college coaches and highly credible evaluators. With the lowest price point on the market, the GymRat RECRUITING INDEX ENHANCED PROFILE service has been designed to allow as many players as possible to utilize this unique service as a differentiator in their recruitment process. At $4.99/month or $50/year, a GymRat RECRUITING INDEX ENHANCED PROFILE costs a fraction of other far less targeted profile sites, such as BeRecruited ($9.99/month or $99/year) or CaptainU (19.95/month). This fee structure is designed to make the GymRat RECRUITING INDEX ENHANCED PROFILE service affordable to players of all income levels.